PaperKarma is an iPhone app with the potential to change your life by ending junk mail. No more shredding. No more tearing items into small pieces after your shredder overheats from too much work. The potential for fewer trips to the recycling bin exists. Yes, a dramatically less papered life may actually be possible with PaperKarma. No one appreciates the PaperKarma iPhone app more than me right now. My husband and I are moving, but we’ve chosen not to move seven years worth of his circulars and junk mail. Our shredder may not survive, and my husband may not without his diligent use of PaperKarma from here forward. When you open the PaperKarma iPhone app, you quickly sign up and register. Incredibly, PaperKarma makes registration painless. You enter your full name, mobile number, and email with your iPhone keyboard. PaperKarma requests location services authorization to determine your address. And, it is spot on. I only needed to adjust two digits of my address. That’s all you have to do, and you are ready to eliminate junk mail. PaperKarma integrates your iPhone camera to determine the party creating too much clutter. You snap a photo of the unwanted mail, and PaperKarma does the rest. You can use PaperKarma to eliminate unwanted magazines, catalogs, coupons, fliers, mailers, credit card offers, and telephone books. It is super quick and easy. With three touches, you literally pass the task to PaperKarma’s iPhone app. There is a list view, so you can track what requests were successful, are pending, or failed. The list view contains a thumbnail image of your submitted photo, as well as the status and time submitted. PaperKarma sends you a pop-up message to let you know when the request has been completed. You are warned it may take a couple of weeks for the unwanted mail to end completely. It’s quick, easy, and effective. 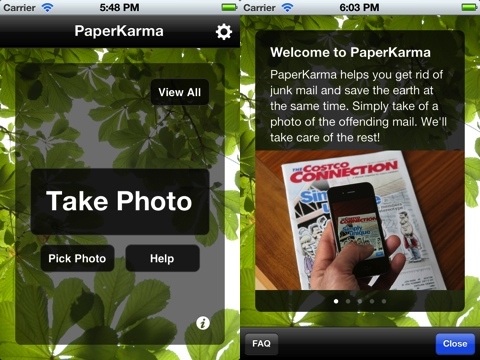 PaperKarma is an iPhone app in the same vein as Fast Customer. It takes a dreaded time waster, and it does it for you. You take a moment to touch your iPhone screen a couple of times, and you get a response with completion and status on your iPhone. 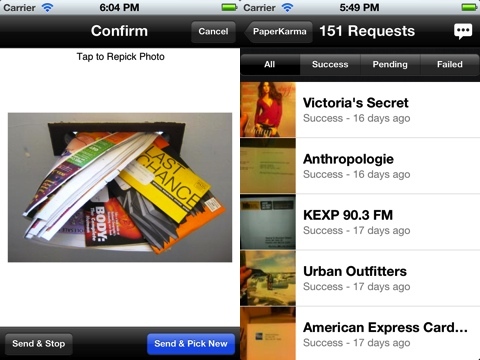 PaperKarma’s iPhone app is visually attractive and enormously intuitive, but it really doesn’t have to be. Its positive impact on your life give it beauty and value. I grabbed it during a sale for free. But, it would be worth a $1.99 download. AppSafari review of PaperKarma was written by Jenni Ward on March 14th, 2012 and categorized under App Store, Free, Reference, Utilities. Page viewed 4660 times, 1 so far today. Need help on using these apps? Please read the Help Page.